“Oh I don’t know,” he said. So Joe and I sat across from the desk we share and got into a discussion about resurrection as I was beginning to compose my Easter sermon. I had no idea back then in 2012 that it was going to change me. For one thing, it was nothing new, my asking this question. I’d been posing it for no fewer than forty years, intrigued since at least seminary with the notion of what it means to live the resurrection. The time has come to ask Christian theologians…what they mean by the resurrection of the body and by eternal life. Is this a promise of immortality of life after death? In other words, is the psychological premise of [Christianity] the impossibility of reconciling life and death either in “this” world or the “next,” so that flight from death—with all its morbid consequences—is our eternal fate in “this world” and “the next”? For…that perfect body, promised by Christian[s]… is a body reconciled with death. In the last analysis [Christianity] must either accept death as part of life or abandon the body. I grabbed another book, one that I love. 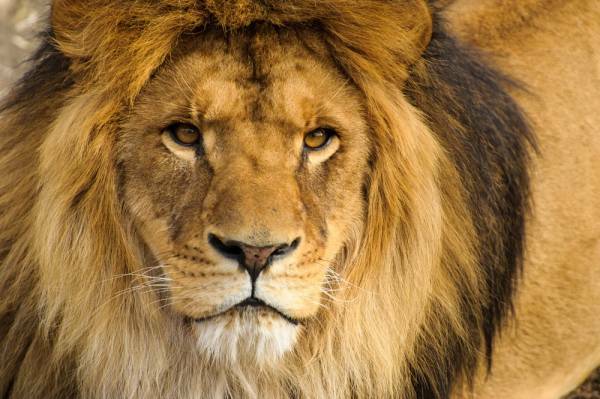 It’s C. S. Lewis’s The Lion, the Witch, and the Wardrobe, in his Chronicles of Narnia. I flipped to that passage where Aslan, the great lion, willingly goes to the Great Stone Table to let himself be sacrificed in place of pitiful Edmund, who’s run afoul of the White Witch. It’s much too long a passage to read to you, or even to sum up. Suffice it to say that the little Pevensy girls stand in the shadows watching a jeering, mocking, cursing crowd of fiends and brutes cruelly shave, muzzle, and finally bind the great cat to his death on the cold stone slab. Lucy and Susan manage in the darkness to remove the muzzle from the dead lion, and sob and cry until at last they notice that little mice have appeared. The mice, perhaps hundreds, have come in the darkness just before the sun has risen and are gnawing through the ropes binding Aslan’s corpse. We are at the beginning of Holy Week when we get to follow that dolorous way of the cross, watching another rabble mock and scourge and spit upon and string up the Son of Man. So we’re not quite ready entirely to ponder the resurrection just yet, are we? Instead, let's look at two stories. 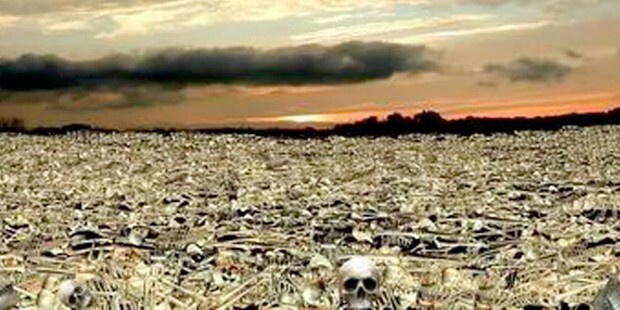 One is a vision, Ezekiel’s celebrated vision of the valley of dry bones. "Our bones are dried up, our hope is lost..."
A voice says that they are the whole house of Israel, as good as dead, dismembered, bleached dry, useless. But the vision of new life unwinds. Bones rattle together. Muscle and sinew and skin cover them. Then the ruah, the wind, the spirit enters them and becomes their breath. It is a redoing of creation. The spirit that moved over the face of the deep when there was nothing but a watery darkness now moves into the slain and brings them to life. What does it mean? Then another story, even weirder than the vision because it purports to be factual. 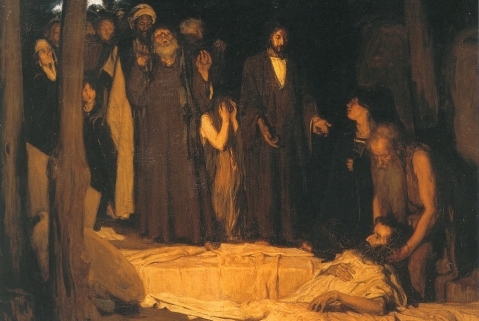 Jesus gets word that Lazarus, a man whom he loves, is ill. Instead of rushing straightway to Bethany, Jesus delays. By the time he arrives, Lazarus has died and has been buried for four days. Jesus is deeply moved, weeps even. They take him to the tomb. He prays. He calls. “Lazarus, come out!” And the man whom he loves comes out not as a corpse, but alive, still wrapped in the grave-bonds. “Unbind him,” commands Jesus. “Let him go.” What does it mean? Ezekiel tells us the meaning of his vision. What happened in the valley of dry bones is what Yahweh will do to Israel. They say that they are no better than bones, their hope clean gone, their future cut off completely. Yahweh will breathe the Spirit into them, bring them home to their own soil. And they will know who has recreated them. And the meaning of the raising of Lazarus? In John’s narrative it is the last straw for the authorities, the overwhelming impetus for putting Jesus to death. In a larger sense, one cannot read the story without hearing overtones of the story which is yet to come, a story of a tomb sealed with the customary stone, a dead man inside covered in grave-clothes down to a napkin over his head, a voice shaking the world like thunder coming from heaven. So all of these stories, The Lion, the Witch and the Wardrobe, the “Valley of Dry Bones,” the “Raising of Lazarus” are like so many sparks emanating from a single bonfire burning at the heart of human experience. They all get at the truth differently, but the truth they get at is a truth about embracing mortality. It is the Truth himself who oddly says, “If you care about saving your life, you will lose it, but if you lose your life for my sake, you will find it.” Every instinct in us wants to save our lives, beginning with our bodies and spreading out to everything material that props them up. We love our things, our systems, our habits, our idols, our money, our pedigrees, all that stuff. And, ironically, not always but often, much of that stuff comes between ourselves and our plain old bodies, our natural naked vulnerability. We have a hard time even believing that we would ever be safe, let alone whole, if we once stopped worrying about it all. We’ll make a thousand excuses to hold on to what we’ve got. We’ll do our best to fend off change, mistaking change as life-threatening. And the irony is that death is defanged the moment we begin to embrace the inevitability of death. That’s not the moment when we know we are on our way out of this life, but the moment when we can behold our own bodies and love them the way God loves them. St. Bernard of Clairvaux once said that the highest form of love was not the love of God for God’s sake, but the love of self for God’s sake. That’s where new life is born. And it does not stop where it starts. When we begin to love our bodies, our senses, without which the knowledge of God is impossible, we begin loving the things and people around us as we love ourselves. Start practicing that kind of love and you’ll find that it’s a lot more fun than arguing, fussing, and fighting. Begin loving profligately rather than measuring love out cautiously and you’ll find yourself laughing more than controlling. Gradually shed your fixations and get playful and you’ll see how right Jesus was when he said that unless you become as a little child, you’ll just miss the boat to the kingdom. Here’s the secret, and it is a pretty well kept one. There is a difference between making a pact with death and embracing death. On the one hand, making a pact with death is to resign oneself to the ways of death, most of which are pretty good at masking as life-sustaining, like that list of things we desperately want to cling to. On the other hand, embracing death is facing into the wind, stepping out into space trusting that there’s a Love strong enough to hold us close and never let us go. You can’t be the Body of Christ without embracing death. You can’t be the Body of Christ and opt out of facing the cross. And that means more than persevering through suffering, though that might be in the cards. It means affirming the physical, your own bodily life. It means you let go of the fantasy that life is in the past. Norman O. Brown, Life Against Death: The Psychoanalytical Meaning of History (Middletown, CT: Wesleyan University Press, 1959), pp. 308-9. Alterations mine. C. S. Lewis, The Lion, the Witch, and the Wardrobe, vol. 2 in The Chronicles of Narnia (New York: HarperCollins (Harper Trophy), 1950, 1978), pp. 150-164.